Recipes from this box to come soon! Is this what it's like to grow up? I spent the last 10 weeks of my life studying for the Series 7, and it slowly killed my soul. The weekend before I finally took the exam, which happened to be the weekend of two of my best friends' birthdays, I sat at home by myself and studied. When the instagrams of my friends having fun without me became too much to bear, I gave up reading about the code of arbitration procedures and popped open a bottle of cava. I don't know if it was the wine, the defeating spirit of the 7, or my biological clock starting to click... but on this sad Friday night, I found myself crying during an episode of Say Yes to the Dress. I have been incredibly lazy about cooking lately. I went to Sam's Club at the beginning of this month and bought a ridiculous amount of prepared food. My fridge is stocked with breakfast sandwiches, turkey and veggie burgers, country fried steaks, brown rice, and random assortments of vegetables. AND IT ALL CAN BE MADE IN THE MICROWAVE! ...Except the rice. When I tried to cook rice in the microwave I caused a small kitchen fire that fill the house with smoke, twice. After such a long affair with the microwave, I knew there was only one ingredient that could make my oven forgive me. It had to be the patron saint of all things delicious, Nutella. I know I just posted Nutella Bites, and these aren't really truffles, more like cake balls really, but I'm still writing about them because they are that good. Don't take my word for it, go and make them yourself! Bake the brownies until a tooth pick comes out almost clean. You want it to still be gooey, but not so gooey that it still has the consistency of batter. Let the half-baked brownies cool, at least until you can comfortably touch them. You can let them cool down all the way, but I'm not patient enough for that. Remove the brownies from the pan and place in a large bowl. Crumble up the brownies until you have a bowl and delicious chocolate-y crumbs. Start adding Nutella to the bowl and mix in into the brownies. You are going to be rolling these into balls, so you want enough Nutella that the truffles are dense, but not enough that they can not hold their shape. Once the Nutella and brownie crumbs are mixed, start rolling the mixture into balls and set on a seperate tray to cool (if you didn't let the brownies cool earlier). This part gets messy... 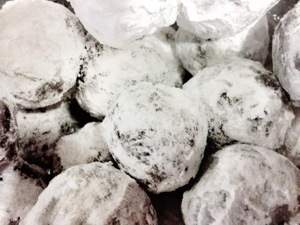 Roll the balls in confectioners sugar so they are completely covered. 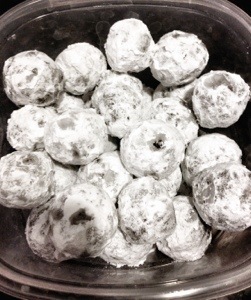 I poured the sugar into a medium bowl to make it easier to coat the Nutella balls. Before you put the sugar coated truffle back of the tray shake off any excess sugar. 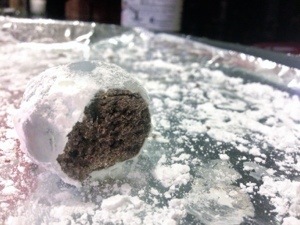 If you didn't let the balls cool before coating them, the sugar may start to dissolve. If this happens, just roll them in the sugar again to add another coat. I never really liked sweet potatoes until I went to college in Memphis. Growing up I think sweet potato fries looked too much like carrots for me to give them a try. After trying the fries at Young Avenue Deli in Memphis, I became obsessed. I went to Sam's Club this weekend and bought sweet potatoes in bulk; I eat them so often that this is actually necessary. Usually, I just wrap them in foil and throw them in the oven, then stuff them with cheese, spices, and fruit, but I wanted to try something new.